A beautifully handcrafted podium that commands a dignified presence. Wide reading surface illuminated by a recessed fluorescent lamp; also features surface mounted digital time piece (Model 711 only). Unit moves easily on four concealed casters; 2 locking. 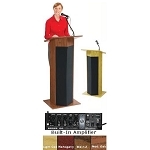 Self contained solid state multimedia amplifier offers two mics and one line in for CD/Tape play plus optional wireless mics. Two line out jacks provide expansion possibilities for additional speakers and tape recording and sound may be customized via the full range tone controls. Provides ample storage and features an adjusting shelf. Available in Light Oak, Medium Oak, Walnut, and Mahogany. Power Output of 50 watts. 2 Condenser type handheld microphones with 9' cable, tie-clip/lavaliere with 10' cable. Four 8" high efficiency speakers. Inputs for two mics, one aux. Outputs of line out 1 extension speaker and line out 2 - tape recorder. 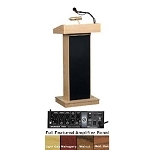 Weight #711 Sound Lectern 110 lbs. 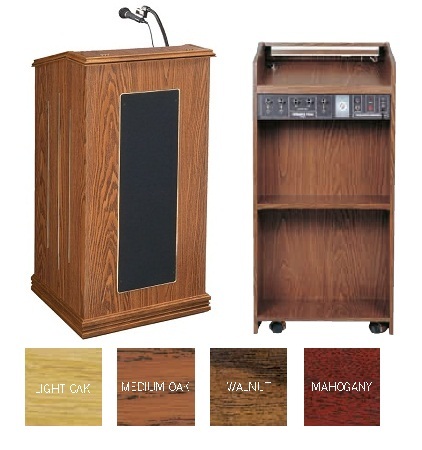 Competitive Edge Products, Inc. is an authorized distributor of the Oklahoma Sound 711 Lectern. Q: Is the lectern easy to put together? Fast Shipping: Orders for the National Public Seating 711 generally leave the warehouse within 1-2 business days. Delivery Details: This product generally ships directly from the warehouse in Clifton, NJ. This item generally ships via FedEx and may not require a signature. Dimensions: 47" x 22" x 18"